Rooibos Crème Brûlée is a must try! A blend of Rooibos, carob & vanilla pieces creating a creamy, burnt sugar-esqe rooibos dessert tea. YUM! Rooibos (pronounced “roy-boss”) Tea, can sometimes be known as Redbush Or Red Tea, this tea comes from the Shrub Aspalathus Linearis, which is only found on the slopes of Cape of Good Hope in South Africa. Although many attempts have been tried to cultivate it elsewhere they have all failed. It's the healthy one, and it's naturally caffeine free. Redbush Tea is all Organic and although there are little studies on the herb it is known that it carries very high antioxidants, more than that of green tea albeit slightly different types. 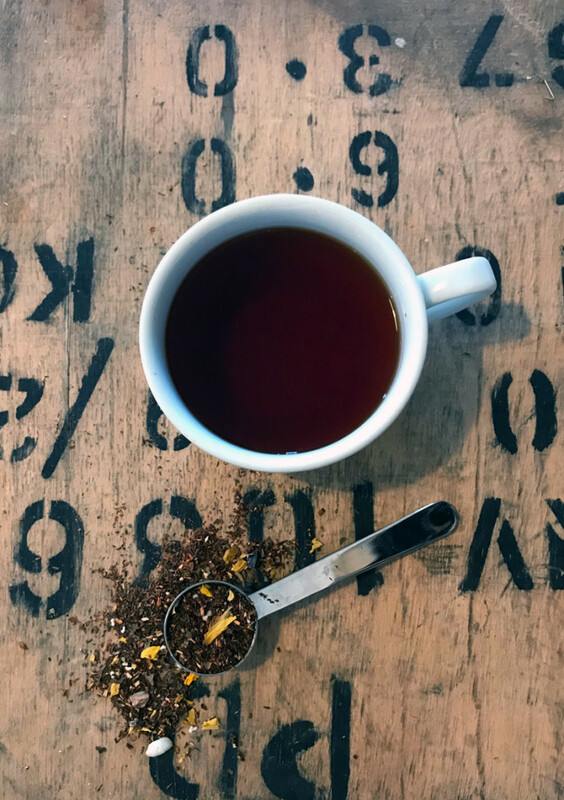 It is also well known for its medicinal qualities, however as we are not doctors, we have decided that if you're going to drink this Rooibos Tea for health reasons it might as well taste as good as possible! But this month we are focusing on Rooibos Crème Brûlée as our Tea of the Month. It is a blend of Rooibos, carob & vanilla pieces creating a creamy, burnt sugar-esqe rooibos dessert tea. It's a real taste sensation a smooth, sweet cup. * Suki Tea Rooibos Crème Brulee picked up 1 star at the 2016 Great Taste awards, with the judges comments of “Innovative. A pleasant, lingering, comforting flavour, whilst being surprisingly refreshing”. Infuse one tea measure per pot or one heaped teaspoon per cup, use freshly boiled water 100ºC, brew 3-5 minutes. Why not try as a Latte? Start as above brew one spoon of Rooibos in boiling water. Brew for 3-5 minutes to make a concentrate of the tea (this espresso) then top with hot, frothy milk. We've a few recipes which you could try too; tea is such a versatile ingredient it is well worth experimenting with. "Very nice. A sweet caramel taste." "Lovely - caffeine free and delicious. Good with dessert!" "Heaven in a cup. Great served cold as well"
Usually £4.90 for a pack, for March we have this tea on special offer at only £2.45! Go on it's worth out! You can check out the full Rooibos tea range here.